Makes a great home office, guest room or play room! 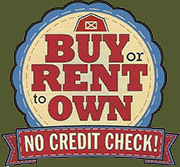 NOTE: This is not a Rent-to-Own model. Leveling: Leveling up to 18" is included. Support System: 3 each 4"x 4" pressure treated runners. Floor Joists: Pressure treated 2"x 6"
Top and Bottom Plates: Number 2 white wood. top and bottom plates double top plates on 12' to 16' wide models. Ceiling Rafters: 2"x4" boards on 10' wide models, 2"x6" boards on 12' and 16' wide models. Number 2 white wood spaced on 24" centers. Roofing: 7/16" 4'x8' sheets of OSB , the industry standard. Fascia Board: 1"x4" primed white wood all sides. Shingles: CertainTeed Traditional shingles, the professional choice. Shingles are warranted for 25 years. Roof Shingle COLORS. 12" overhang above the front double doors included upon request. Double Doors: Either 48", 60", or 72" wide openings. Door Design: Customize by choosing from five Integrity Door Designs. Ventilation System: Two each louvered gable vents. Paint, flower box, cupola and windows not included in base price.